Education has long been pushed as a silver bullet for Social Justice issues, yet many in our community have found and continue to find that the education system is often a barrier to disabled equality and worse actively contributes to our inequality. It is too big a topic for this chat to be comprehensive, but the chat will examine some of the very complex issues our community is engaged with in education. 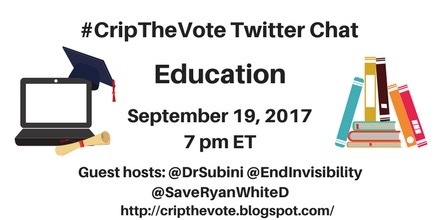 Welcome to the #CripTheVote chat on education. Please remember to use the hashtag when you tweet. We are pleased to have guest hosts @DrSubini @EndInvisibility @SaveRyanWhiteD with us today! Q4. How do ableism and racism work together in our school systems? Thank you for joining the #CripTheVote chat on education. Please continue the convo! 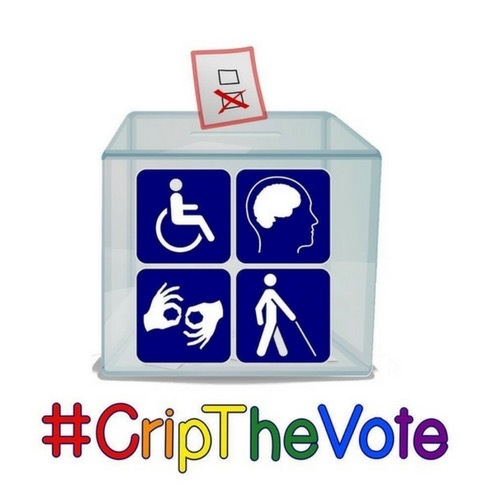 A Storify from today’s #CripTheVote chat will be up shortly. 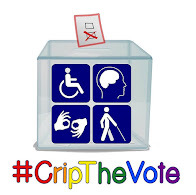 The organizers of #CripTheVote invite candidates for office who are disabled to participate in live, scheduled Twitter chats this year and next. These will typically be about an hour long, and structured by questions, about half posed by the organizers, and the rest from #CripTheVote participants. Our aim is to give disabled candidates a disability-centered forum in which to discuss their positions, campaign plans, and how they view their own disabilities in relation to their political goals. 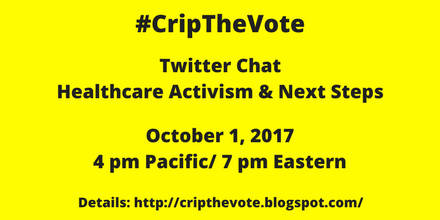 Like all #CripTheVote activities, these chats and this invitation are non-partisan. We do not endorse or oppose any candidate or any party. Candidates can expect to be questioned, sometimes vigorously, on how their policies might affect people with disabilities. #CripTheVote is an online movement about politics, policy and civic participation focused on disabled people and disability issues. It was started in January, 2016, by Alice Wong, Gregg Beratan, and Andrew Pulrang, to focus attention to disability issues and disabled voters during the 2016 elections. Here is a link to our April 2017 chat on Disabled People in Public Service. Candidates with disabilities, and / or staff can respond to this invitation by emailing to: cripthevote@gmail.com.